This is the slightly-altered text of the paper I delivered at the British Society of Eighteenth Century Studies (BSECS) conference in Oxford, January 2017. 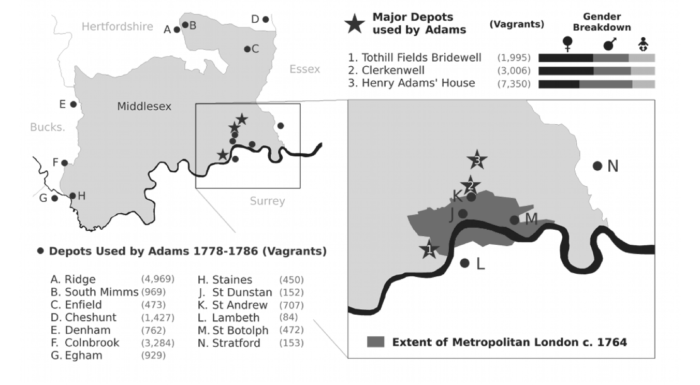 Figure 1: Adam Crymble, ‘Depots used by Henry Adams to convey vagrants into and outo Middlesex, 1778-1786’ (2014). I’d like us to consider unwanted Irish migration to eighteenth century London, around the time of the American Revolutionary war. And I want to complicate that by thinking about unintentional Irish migration to eighteenth century London. I’ll do my best to show the extent to which the two were connected. In doing so, I’d like to suggest that many of the ‘problems’ associated with the Irish in London were actually facilitated by the state as part of the infrastructure of war. So let’s start with the idea of unwanted Irish migration. And by unwanted, I basically mean poor. Economics is one of the primary objections to migration. We don’t like things (or people) that cost us money. The rich object to the potential threat to the poor relief system the Irish might pose, requiring extra taxes to feed hungry mouths. The poor object to the Irish competition for low-paid work, putting their own families under increased strain. These fears have contributed to the group’s bad contemporary reputation. They were poor. Often had young children. Lived in squalid conditions, work for low wages, and had a reputation for crime, poverty, and drink-fuelled violence. Those are the stereotypes of course. That’s not to say nobody wanted these people. We know there were plenty of women willing to marry Irish migrants and have children with them. We also know that employers were happy to hire them. So I use the term ‘unwanted’ with the caveat that it’s a perspective rather than an objective truth. Unwanted migration was officially controlled by the Vagrancy system laid down by the Vagrancy Act of 1744. If someone didn’t have settlement locally, and they were declared a vagrant by a magistrate, they would be expelled back from whence they came, as defined by their legal settlement. In Middlesex that was controlled centrally and involved a man named Henry Adams shepherding vagrants to the edge of the county. The map in Figure 1 highlights that network of depots used by Adams for doing this work. This map was pieced together by my colleagues and I as part of a project that we call ‘Vagrant Lives’. Part of that project was to build a dataset of all 14,789 people for whom we have a surviving record of their experience with the vagrancy system at this time. That dataset has been published in the Journal of Open Humanities Data, so please feel free to use it. One of the things it’s let us do is to explore how groups of vagrants expelled to different parts of the country were distinct from one another. Figure 2: Demographics of Scottish Vagrants by Month of Expulsion 1777-1786. 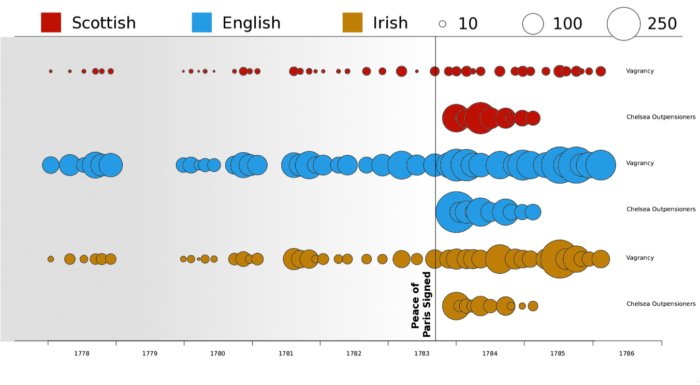 Figure 3: Demographics of Irish Vagrants by Month of Expulsion 1777-1786. One group who clearly stands out as different is the Irish. They are overwhelmingly male. This is unusual for vagrants, because this system was largely used to expel unwanted English women and their children who together might become a burden on the poor relief system. 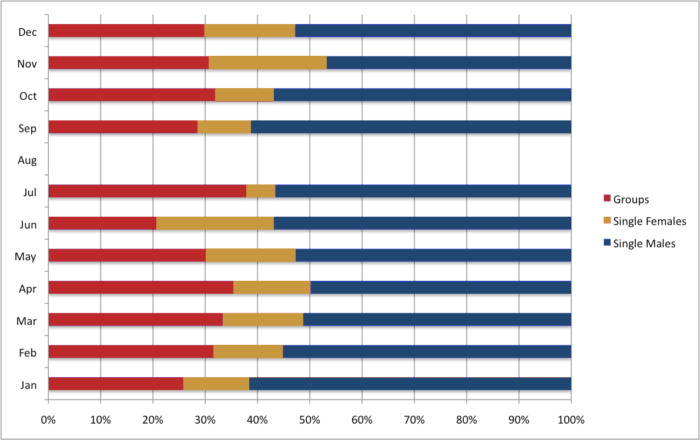 Amongst the Scots, it’s predominantly families as you can see on Figure 2, with the red lines representing groups of people expelled to Scotland. So again, possibly related to the poor relief system. But not the Irish: distinctly male, and distinctly men travelling on their own (as the blue lines in Figure 3 show). The Irish didn’t technically have settlement anywhere. That was a British idea, not an Irish one. So technically you couldn’t expel the Irish – though in practice the vagrancy records show they clearly were sent away. Nevertheless, this means the letter of the law meant the Irish were treated differently by this system. From what we can tell, a significant proportion of the Irish seem to have volunteered to go, turning up at the Lord Mayor’s office and requesting a vagrant pass. As Tim Hitchcock has previously showed, these became available in the early 1780s as the City of London sought to find space in its gaols now that the American colonies were no longer available as a destination for convicts. You weren’t really supposed to be able to volunteer to be a vagrant, but for the Irish it was a free (if uncomfortable) ride home. And for the City of London, it was a way to get rid of a few extra bodies from an already overcrowded space. We see over 1,100 Irish men granted Vagrant Passes back to Ireland in these years. Now, the vagrancy records are a bit patchy. We’ve got 42 of a possible 60 sets, meaning we don’t have the full picture. We’re missing all of 1779, for example. But Figure 4 shows the number of each Scottish, English, and Irish vagrants expelled by session of the Middlesex Bench, and I think it gives a fairly good idea of what’s going on. In particular, the circles increase in both frequency and size when the Peace of Paris is signed to end the American Revolutionary War. The vagrants also become more male, even in Scotland, which I just mentioned was known more for family units expelled. 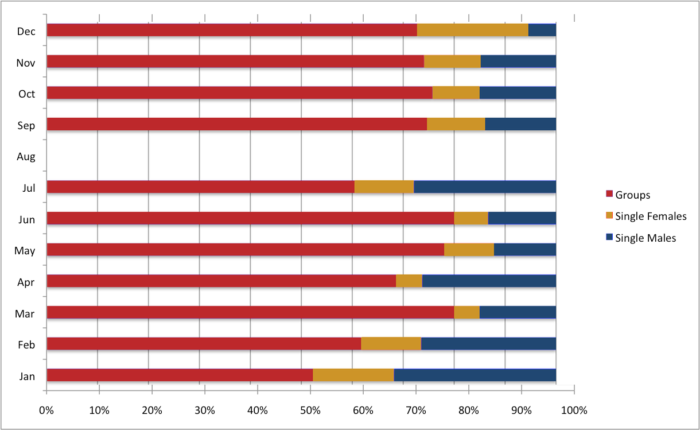 Figure 4: Middlesex Vagrants and Chelsea Pensioners by nationality, 1778-1786 (partial). Derived from Vagrant Lives Dataset and Chelsea Hospital Medical Examinations. This says ‘demobilisation’ to me, and the male nature of most Irish vagrants suggests that this may have been a strategy for getting home after the war. Demobilisation was heavily centralized in London. Soldiers and sailors weren’t taken home; they were dropped off and left to find their own way. Under the vagrancy laws of 1744 they had the right to beg their way home, but few provisions were in place at this time. That is, unless you were injured. Disabled or long-serving soldiers had the right to apply for a pension from the Chelsea Hospital (army) or Greenwich Hospital (navy). Both Chelsea and Greenwich are within a few miles of London, hence it was not too difficult to expect a wounded soldier to hobble to the hospital from the quay. And thus made London a good spot to demobilise the military. Soldiers were given a time and a date and told to show up at the hospital for a medical examination. These examinations survive for the Chelsea Hospital in their entirety, meaning we can get details of the names, injuries, and birthplaces of every soldier who showed up seeking a pension, as well as precise details of the day he was in Chelsea. This means we can look at the timings between the use of the Chelsea Hospital and the increased use of the Vagrancy system, to ask if we’re looking at the same group of people. I’ve not yet managed to transcribe the whole set of these pensioners, because quite frankly the records are vast and this is a work in progress. But I did look at those immediately after the Peace of Paris, until early 1785 when the rate of demobilisation had really started to trickle and peter out. I was surprised by the sheer scale of Irish involvement in the military and how that transfers into an Irish presence in London. The volume I transcribed included the details of 862 Irish soldiers. About 20% of all soldiers in the volume. If I had the entries for the previous year, I’d expect we’d be talking about 2,000 Irish soldiers physically in London in the months and years following the end of the American Revolutionary war. 2,000. That’s a lot of people. And those are just the Irish ones. This is despite the fact that Irish Catholics were officially barred from military service until the American Revolutionary War. Of course, Terence Denman has refuted that ban in practice. So 2,000 extra Irish people in the area. Or I should say: at least 2,000, because they are just the ones who were eligible for army pensions. I haven’t looked at sailors. And the Chelsea Hospital records at this time don’t include those soldiers who survived able-bodied and sound of mind and of whom we have no clear record of their identity. Even if these men intended to leave and head back home almost immediately after their examination, what we see is an intense pressure on London for a short time at least. The new faces needed feeding, housing, and negotiating in social spaces. Crime records from the Old Bailey show that these interactions didn’t always go smoothly. The fact that these men were dumped in London, I think complicates our traditional understanding and models of migration. These are not really push or pull factors. These aren’t seasonal labourers seeking employment on the farms surrounding the capital, as highlighted by Barbara Kerr. They aren’t the willing emigrants who were too poor to make the trip to America, as highlighted by Lynn Hollen Lees. These are people who were paid to do a job and their employer left them in London when they were done. The government may have been aware of an Irish poverty problem in London, but it seemed utterly unaware that its own systems were contributing actively to it by funneling young Irish men towards the metropolis. The Irish in particular get younger over time in the Chelsea Hospital records. While not the case with the Scots or the English, the average age of an Irish pensioner in 1812 is 30 years old, compared to 40 for the Scots. That’s a substantially different phase of the life-cycle, and may be a key to understanding some of the Irish stereotypes at the time. Namely: that they were willing to work for less money, live in squalid conditions, and like to drink and fight at the pub. You could be describing an undergraduate experience there. People living away from home and on their own for the first time in a new environment. I think that raises some questions about the Irishness of these stereotypes, and whether or not we should instead be thinking more carefully about demographics. Are these Chelsea Pensioners turning to the Vagrancy System to get home? This would make sense, because most of these Chelsea pensioners are quite severely injured, and often in ways that would prevent them from walking home. Nevertheless, the answer is: No. Or at least, it’s incredibly rare to be able to trace an individual in both the Chelsea Hospital and Vagrancy records. I only found 23 out of 850 Irish soldiers who did so. Many of those had complaints about wounded legs and feet in particular, but the practice is just so uncommon. One of the only deliberate cases is that of Irishman Robert Lawson, who showed up for his examination at Chelsea in January of 1784, then a few days later took his wife and two children to the Guildhall in London where they requested a vagrant pass, and received their free ride home. Of those who appear in both systems, Lawson and his family left quickly: within a week. That was enough time to leave a few marks on the city, but not many. Others stayed considerably longer. Patrick Gearing stayed for the summer, leaving 6 months after his examination. Patrick Downey too stayed for the summer. Owen Morris left just before Christmas, after 3 months in London. And William Robinson left as a vagrant almost a year after his exam. The vagrancy records also support a lag. Large cohorts of Irish leavers appear throughout 1785 when the demobilisation process had already come to an end. Some of this can be explained by seasonal harvest workers who also used the vagrant passes to get back to Ireland, but not all. Some of these men were soldiers and sailors, and this system was a means of leaving when they had their fill of London. Unfortunately, the vagrancy records don’t survive for London after 1785, and it’s distinctly difficult to trace these men across different types of records, so its difficult to get a clear picture of how many of these demobilised Irish men stayed in London, and for how long. But I think we can say that the group was large enough and their time in London intense enough that we need to make sure we include them in our understanding of migration to the capital. These temporary relationships between the Irish and London aren’t captured by the traditional narrative. It’s not a case of a push or a pull factor. It’s more complicated than that. The relative youth and comparative lack of skills of these men may well have contributed to the negative reputation of the group. But to give these Irish individuals their due, we need to see their migration to London as many of them would have done: accidental and unwanted. 1. Tim Hitchcock, Adam Crymble, & Louise Falcini, ‘Loose, idle and disorderly: vagrant removal in late eighteenth-century Middlesex’, Social History vol .39, no. 4 (2014), 513. 3. Tim Hitchcock, ‘The London Vagrancy Crisis of the 1780s’, Rural History, vol. 24, no.1 (2013), 53-66. 4. Adam Crymble, Louise Falcini, & Tim Hitchcock, ‘Vagrant Lives: 14,789 Vagrants Processed by the County of Middlesex, 1777-1786’, Journal of Open Humanities Data, vol. 1, no. 1 (2015): http://doi.org/10.5334/johd.1; Chelsea Hospital Medical Examinations (TNA: WO116/8-9). 5. Terence Denman, ‘Hibernia officina militum: Irish recruitment to the British regular army, 1660-1815’, Irish Sword, vol. 20 (1996), 148-166. 6. Barbara Kerr, ‘Irish Seasonal Migration to Great Britain, 1800-38’, Irish Historical Studies, vol. 3 (1943), 365-380. 7. Lynn Hollen Lees, Exiles of Erin: Irish Migrants in Victorian London (1979). 8. Chelsea Hospital Medical Examinations (TNA: WO116/14).